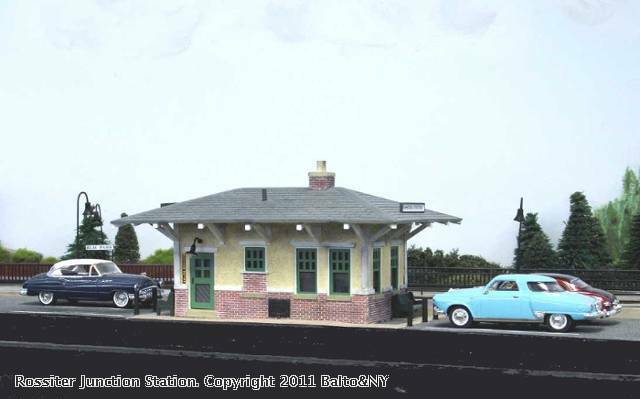 This small suburban station was made from a Plasticville depot kit. The lower sides and ends were cut off just below the doorways and cemented to the top. Pastruct brick was applied for the lower sheathing. Styrene strip rafters and corner jacks were applied. The platform is foam core board with computer printed brick paving. Chalks were used for weathering. This stop is rather near to the main Edgewater Station on the B&NY. It is located across from Rossiter Junction on the east bound main track and Highway 5 grade crossing. The platform is foam core board with computer printed brick pavement. 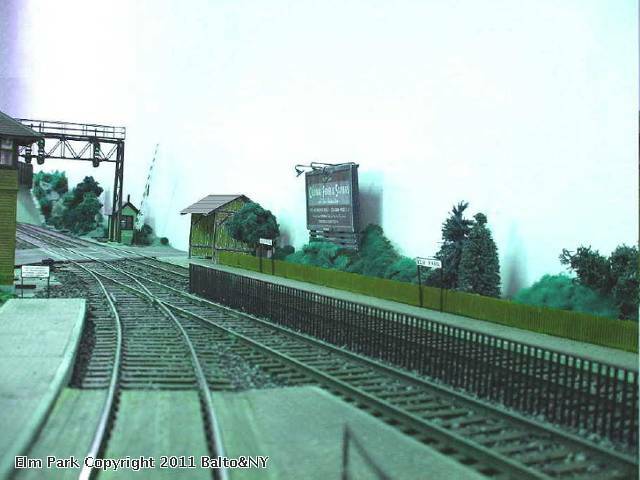 The safety fence along the track is from Plastruct. The shelter in the distance was made by printing a few copies of the 1906 B&O plan for a flag stop waiting shed. It was tinted with colored pencils, glued together and set on the layout as a temporary stand-in until such time when a shelter could be done in styrene.